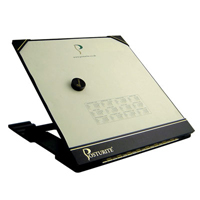 The Premier Copy Holder from Aidata is an economical yet highly functional copy holder. It features adjustable viewing angles of 45°, 55°, 65° and 75° and can accommodate documents up to legal size. 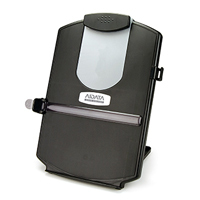 A height-adjustable clip secures documents and the sliding line guide doubles as a line magnifier for fine print. The lightweight folding design makes this document holder easily storable. The Freestanding Document Holder by 3M helps to reduce the risk of repetitive strain injuries to the muscles of the neck, shoulders and upper back. 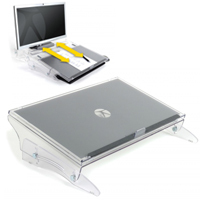 Ideally placed inline between the keyboard and the monitor, the document holder allows users to view reference materials by simply glancing down, rather than by constantly bending or turning at the neck. 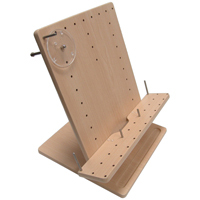 The sturdy, transparent easel is angle adjustable and has a deep ledge to ensure thick stacks of papers, and open binders and catalogues, remain secure. (Note that the angle of the easel will affect the maximum stated sheet capacity.) An elastic line guide helps users navigate through the text, and is strong enough to keep bound materials open. Caution: The elastic line guide is not factory-mounted to the document holder. To prevent possible injury when using this feature, be certain both ends of the elastic are properly secured during installation and use. 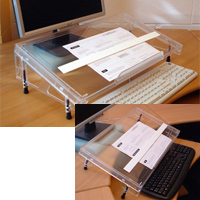 Two models of the Freestanding Document Holder are available. The DH640 is 18" wide, can support up to 300 sheets of paper, and can straddle the base of most flat-screen monitors and many monitor risers, allowing it to make efficient use of available space on the desk top. The DH640 has a weighted base and can be cantilevered below the edge of the desk without modifications, provided the weight of the reference materials is not greater than the weight of the base itself. 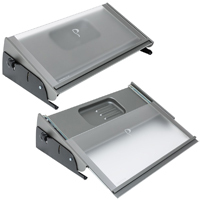 The DH630 is 14" wide, can support up to 150 sheets of paper and has a skid-free, but non-weighted base. This model can also be cantilevered below the edge of the desk provided the base is first secured to the desk surface using the included, removable 3M Command strips. 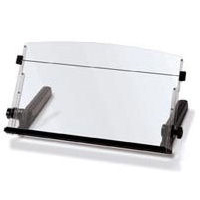 The Metal Arm Copy Holder from Aidata accommodates the placement of documents at a comfortable distance, height and angle for convenient reading or reference. The unit is secured to the edge of the desk or cable grommet by means of a well designed sturdy metal clamp, freeing up desk space beneath the copy holder. The articulating metal arm can be repositioned as desired with adjustable resistance achieved through the use of two small thumbscrews, ensuring that the easel will remain at the desired height and angle. The Metal Arm Copy Holder includes a clip at the top to secure papers. The unit also comes with a transparent tinted line guide to assist with marking position within a document. Le Metal Arm Copy Holder d`Aidata permet de placer les documents à une distance, une hauteur et un angle confortables pour faciliter la lecture ou la référence. L'unité est fixée au bord du bureau ou à l'œillet grâce d'une pince robuste en métal qui est bien conçue, libérant ainsi de l'espace sur le bureau sous le porte-document. Le bras métallique articulé peut être repositionné comme souhaité avec une résistance réglable obtenue grâce à l'utilisation de deux petites vis à molette, garantissant que le chevalet (easel) restera à la hauteur et à l'angle souhaités. 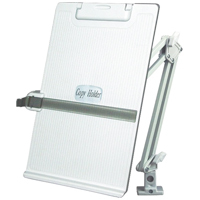 Le Metal Arm Copy Holder comprend un clip en haut pour sécuriser les papiers. L'unité vient également avec un guide de ligne teinté transparent pour aider à marquer la position dans un document.